Burgermaster is a true drive-in, the first in my experience. Pull into a parking spot, flash your lights and over comes a friendly man to take your order. Fast, efficient and convenient. But is it more than just a popular Microsoft lunch spot? The picture doesn’t quite do it justice, not that presentation is high on their list of priorities. The bun bares a striking resemblance to a McDonald’s bun, however the taste, absorbency and quality of the bun are far superior to McDonald’s … which is to say they are average. Average is a theme here. Beef is alright, veggies are decent, cheese is fine. They went with shredded lettuce, which they get away with by virtue of freshness. Setting this burger apart from lesser burgers was a solid effort in bacon and the fine art of cheese-melting. 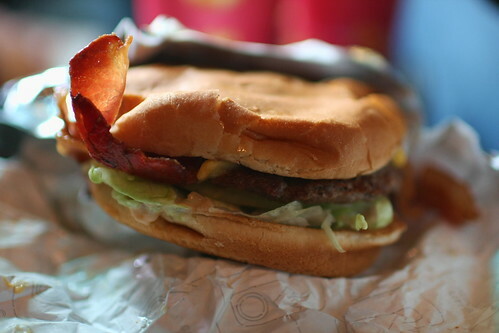 I had “The Baconmaster” which is just their “Burgermaster” with three strips of well-prepared bacon. There was no sauce that I could discern, which is just as well because the cheese was melted well enough where a sauce wasn’t necessary. On the subject of absences, Burgermaster omits the pickles and onions by default. While keeping it simple doesn’t detract from the burger, I feel like these missing pieces could be what they’re missing to push them into the next class. It’s just not the flavor explosion you might find elsewhere with a fully loaded burger. Unbeef: Shake was good. Fries were meh. Going to a real drive-in is rad. + It was a tasty burger, all the pieces are solid. – Average. They could see improvement in almost every area: lettuce by the leaf, a higher quality beef, a nicer cheese or a toasted bun. Needs extra oomph.